In the late 1800s, the fast-growing city of Spokane attracted immigrants from all over the world, including China and Japan. As in other American cities, a combination of anti-Asian prejudice and personal preference caused Chinese and Japanese immigrants to cluster together in neighborhoods called chinatowns. Known as Trent Alley, Spokane's "chinatown" consisted of roughly three blocks in downtown Spokane between today's Spokane Falls boulevard and Main avenue. These courtyards and alleys were densely packed with Chinese and Japanese markets, laundries, hotels and restaurants. Spokane's chinatown began in the 1880s and was at first mostly populated by Chinese laborers who had immigrated in the 1850 and 1860s to work in the local railroad and mining industries. Before the Spokane Fire of 1889, chinatown had a population of around six hundred Chinese. Many Chinese and Japanese businesses were destroyed in the fire, and for the next couple of decades the population of Chinese residents declined, partly due to the Chinese Exclusion Act of 1882 that prevented Chinese laborers from immigrating and denied recently-arrived Chinese citizenship. In 1894 the ban was renewed and in 1904 it was extended indefinitely until it was repealed in 1943. It was illegal for the wives of Chinese laborers to immigrate to the US in the early 20th century, with only American-born Chinese, Chinese dignitaries and some merchants allowed to bring their wives with them. This meant that early 20th century chinatown consisted primarily of men. Spokane's white majority viewed chinatown as an exotic destination that housed many illicit businesses, such as gambling halls, opium dens and houses of prostitution. Due to previously mentioned immigration restraints, the prostitutes were mainly Japanese who had either been coerced into the profession by gambling men or had arrived with them. In the beginning the police turned a blind eye to these businesses until non-Chinese patrons began to frequent them. It was only then that the police began a series of raids targeting them. By 1910, the police raids in chinatown were welcomed as it had steadily been filling with Japanese families, who now numbered around one thousand. This rise meant that the area was now called Japanese Alley or Trent Alley in addition to chinatown. By 1912, Japanese restaurants, laundries, hotels, fish markets, barbershops, and pool halls flourished in Trent Alley. The Great Depression hit the district hard however, and many businesses closed as people returned to their native countries, reducing the Japanese population to around 385 by 1935. WWII reversed this trend, however, when Spokane became a haven for Japanese families fleeing the threat of Internment camps on the West Coast as it was outside the evacuation zone. Many returned to their homes after the war, but a large number stayed behind. After the war, the denizens of Trent Alley dispersed throughout the city and most of the businesses were deserted. In 1974, the remaining buildings and courtyards were destroyed to facilitate construction for the Expo '74. 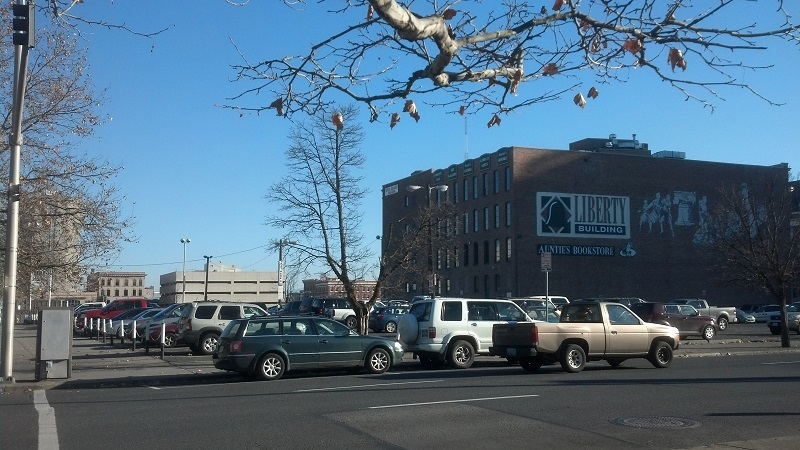 Trent Alley today consists of parking lots for the performing arts and convention centers as well as local businesses, leaving many unaware of the history that lies beneath their feet. They are not forgotten, however. In 1914, Japanese photographer Ryosuke Akashi captured the lives of Spokane's Japanese entrepreneurs in an album entitled Spokane Japanese Business Men and their Enterprises. Akashi carefully photographed each Japanese business and proprietor, as well as Japanese farmers, Japanese baseball players and a Japanese cemetery. "We are always discriminated based on our race in this foreign place," he wrote. "I would like to share our story." 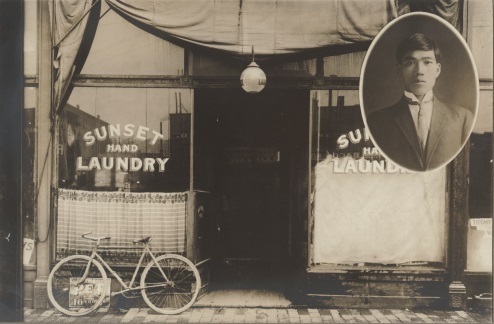 Sunset Hand Laundry 1913, Chinatown: Sunset Hand Laundry in 1913, owned by Yoshigoro Yamane, from Yamaguchi Prefecture, Japan, located near the Northeast corner of Main and Browne. Photo Courtesy of MAC L2003-11.53. 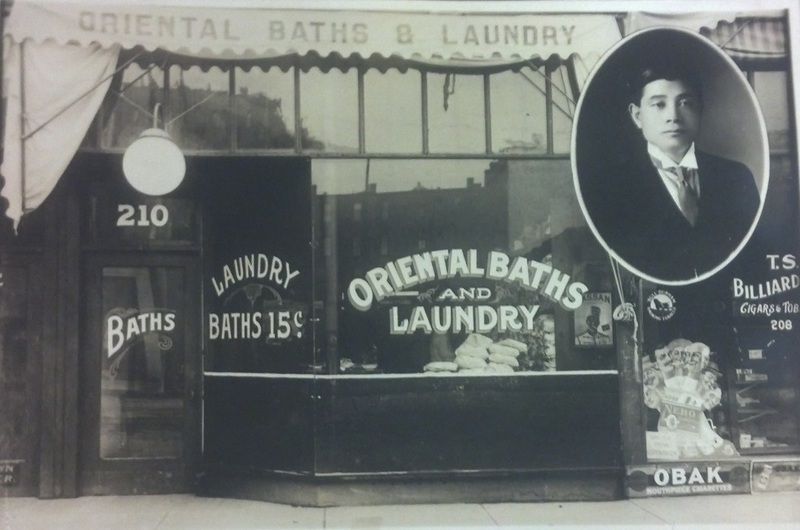 Oriental Baths and Laundry 1913: Oriental Baths and Laundry in 1913, owned by Chujiro Muramatsu from Yamanashi Prefecture, Japan. Photo courtesy of MAC L2003-11.50. 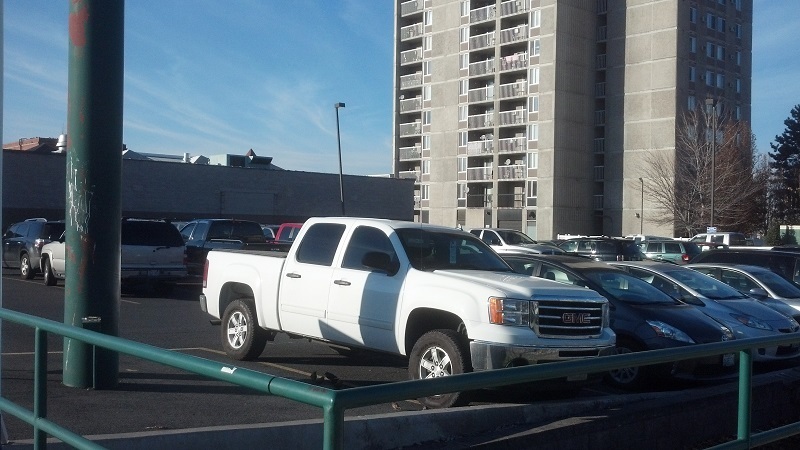 Laundry and baths now a parking lot. : A parking lot is all that exists on the Northwest corner of Browne and Main, where in 1913 Sunset Hand Laundry and Oriental Baths and Laundry used to stand in, on the edge of Chinatown. Photo courtesy of the author. Milwaukee Hotel 1913.: Milwaukee Hotel in 1913, owned by Sanjiro Koyama from Okayama Prefecture Japan, located on Spokane Falls Blvd (then Trent) between Stevens and Washington St facing the river. Photo courtesy of the MAC L2003-11.37. Current site of Milwaukee Hotel: A parking lot now stands where the Milwaukee Hotel used to stand in 1913. Photo courtesy of the author. 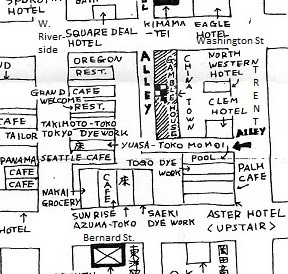 Trent Alley 1910: This hand drawn map shows the many Chinese and Japanese businesses that made up Trent Alley in 1910. Photo courtesy of Issei: A History of Japanese Immigrants in North America. 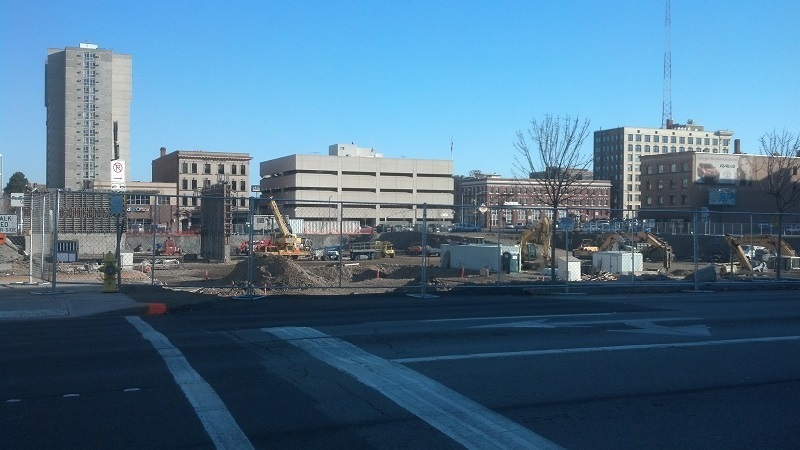 Ghosts of Trent Alley: Though now it is a gaping hole in the ground under construction, this used to be the location of Trent Alley, a city block dense with Japanese businesses. Photo courtesy of the author. 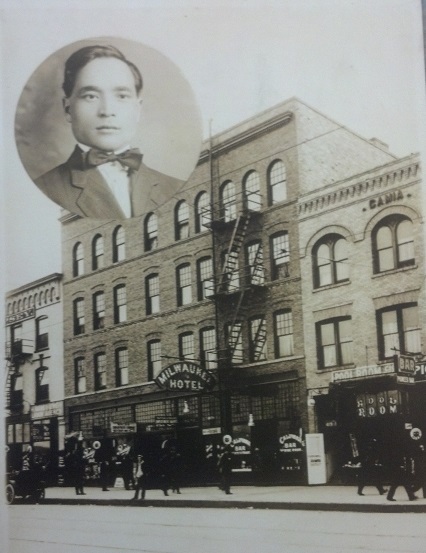 Nicolette Reames, “Spokane's Chinatown,” Spokane Historical, accessed April 20, 2019, https://spokanehistorical.org/items/show/400. Kershner, Jim, from the HistoryLink website. 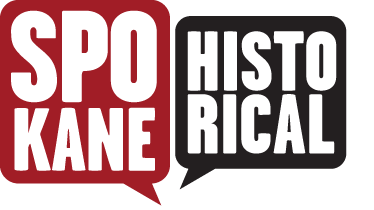 "Spokane Neighborhoods: Old Chinatown -- Trent Alley -- Thumbnail History," available at http://www.historylink.org/index.cfm?DisplayPage=output.cfm&File_Id=8120 Spokane Daily Chronicle. "Spokane's Little Out-of-the-Way Chinatown has Queer Denizens," July 6, 1916. Kalez, Jay J. The Daily Chronicle. "The "Yellow Peril"-A Racial Problem That Disappeared," January 1, 1970.